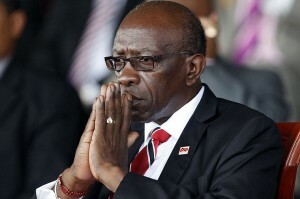 PORT OF SPAIN, Trinidad -- A combination of false statements by disgraced former FIFA vice president Jack Warner and blind acceptance on the part of a Trinidad journalist that what Warner had said was true has resulted in the issue of a letter before action to the head of news at local television station CCN TV6. The letter was written by attorney Ravi Rajcoomar to CCN TV6's head of news Dominic Kallipersad on Tuesday afternoon on behalf of Jitnarine Hardeen, who was the subject of an “in-depth” news report entitled “The Hardeen Exposé” by CCN TV6 journalist Mark Bassant, which aired on Monday during the station’s 7pm newscast. According to the attorney, Hardeen is not featured on a voice recording released to the media by Warner and the CCN TV6 report had "improperly, wrongfully and/or illegally named him and/or referred to him being the source of information on a purported audio recording held by Mr Jack Warner MP." It continued: "My client has listened to your broadcast and instructs us that he is not the person on the tape as alleged by you, your reporters and Mr Warner, MP. In fact, he has no knowledge of the matters that were aired on your station and ascribed to him. "My client further instructs me that he has no knowledge of its contents. My client is of the view that the tape is malicious and false, and Mr Warner, MP is well aware that the tape is false untrue and that the person on the tape is not him." CCN TV6 has been required to respond within 28 days, failing which proceedings may be commenced in the High Court. TV6 is owned by Caribbean Communications Network Ltd (CCN), publishers of the Trinidad Express newspaper, which in turn is a subsidiary of ONE Caribbean Media Limited (OCM), chaired by prominent Barbados attorney Sir Fred Gollop and run by CEO Dawn Thomas. Warner seems to be determined to cause problems for OCM, since the Trinidad Express reported that a director of its ultimate parent company is the owner of a Trinidad-based business that laundered money through illegal currency trades for Warner, who is one of 14 senior FIFA officials and others indicted in New York on multiple counts of racketeering, corruption and money laundering. According to the indictment, Warner used almost half of a US$10 million bribe he is alleged to have received from South Africa to promote its successful bid to host the 2010 World Cup in black market currency trades through JTA Supermarkets in Trinidad. The funds in question were paid from FIFA accounts into Confederation of North, Central American and Caribbean Association Football (CONCACAF) accounts in Trinidad controlled by Warner. JTA Supermarkets subsequently received $4,860,000 from the CONCACAF accounts, paid in installments from January 2008 to March 2009. The largest payment was $1,350,000 paid in February 2008. According to US prosecutors, the money was mostly paid back to Warner in local currency. How the remaining money was disbursed is currently unknown. Carl Mack, owner and executive chairman of the JTA Group, is also a director of OCM. Mack has denied any knowledge of the substantial transactions passing through his business, apparently in contravention of local exchange control laws. OCM and CCN management have consistently declined to respond to requests for comment on these and other issues.